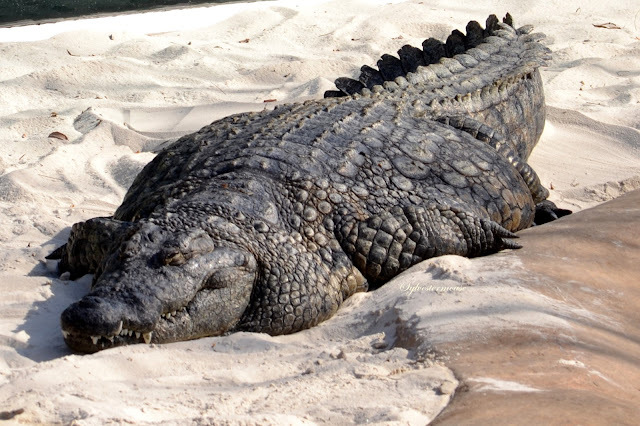 The Nile Crocodile is not an animal that is considered very pretty. Nor is he friendly or one we wish to pet. 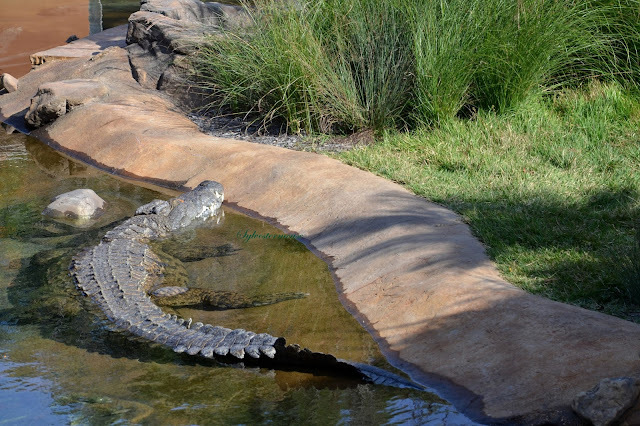 It is actually best to stay far, far away from a Nile Crocodile. However, he is still amazing, so let's talk about him! We can't get hurt just talking and looking at pictures, right? I couldn't help but think when I uploaded this image, what a beautiful mosaic tail he has! Best to keep in mind though, that tail is attached to a very deadly beast. 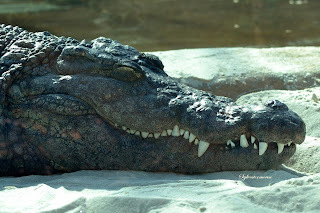 Take a Real Close Look at this Nile Crocodiles Head. I assure you, he is quite alive. He is simply stealthily waiting. The leaf doesn't even bother him. If you look real close, you can see his teeth and his nostrils. 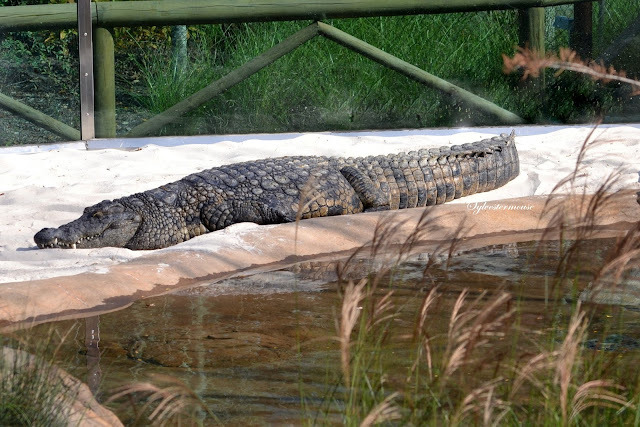 Nile Crocodiles have thick, scaly skin that is quite effective at thwarting potential predators. However, they are themselves, killing machines. Because they have a unique respiratory system that allows them to stay undetected underwater for up to 5 hours at a time, you could literally be in their territory for hours without ever knowing they are present. Just looking at him, you might think he would sink fast due to weight, or swim slow simply due to his massive size. However, neither is true. He swims fast with a terrifying turn of speed that belies his enormous size. I feel sorry for whatever prey is lying in that tall grass! These predators are massive beasts! 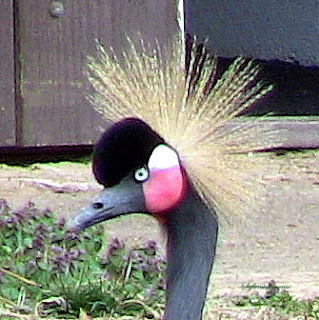 This one looks like he has a full belly. I assure you, these photos were all taken with a high power zoom lens. I have no desire to get close enough to this creature to wake him up. As it was, I felt like he was watching me regardless. 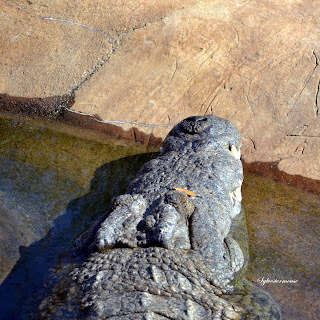 It should be noted that Nile Crocodiles are patient and shrewd. They might wait weeks to strike, allowing a large mammal to get used to coming to the same spot to drink water. They can, and do, eat humans. Eeow - they eat humans? Scary. Especially scary to learn some have recently been found in Florida. Were they brought over from Africa and set loose, or escaped, I wonder? Not a good idea. Regular Florida 'gators are enough to worry about. I was just looking at similar pictures but from the Philippines and they made me shudder. Maybe, time to get to know them better. That's one creature I sure would not want to surprise me. I hope this beast never gets loose in California.